As a service and resource for our valued clients, we are developing a series of blog posts which are meant to be resources with valuable information, downloads, pdf’s etc. 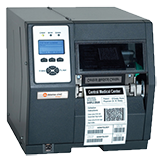 This week we bring you the Datamax-O’Neil H-Class Mark II Thermal Printer PDF user manual and printer drivers download. • Scalable Fonts: CG Triumvirate Bold Condensed, CG Triumvirate & CG Times with Cyrillic, Greek Arabic and Hebrew character support. • Over 50 resident character sets; Unicode/UTF8 support. • All fonts expandable vertically and horizontally up to 24x; fonts and graphics can be printed in four directions: 0°, 90°, 180° and 270°s. • Any font or graphic field can be printed as a normal or reverse image. • Tear-off and rewind modes: 0.25 (6.35mm). • Peel and cutter modes: 1.0” (25.4mm).